Teams from all over the region traveled to Pittsburgh to wrestle on Saturday, but the Panthers had no trouble with any of their competition after a close opening match. 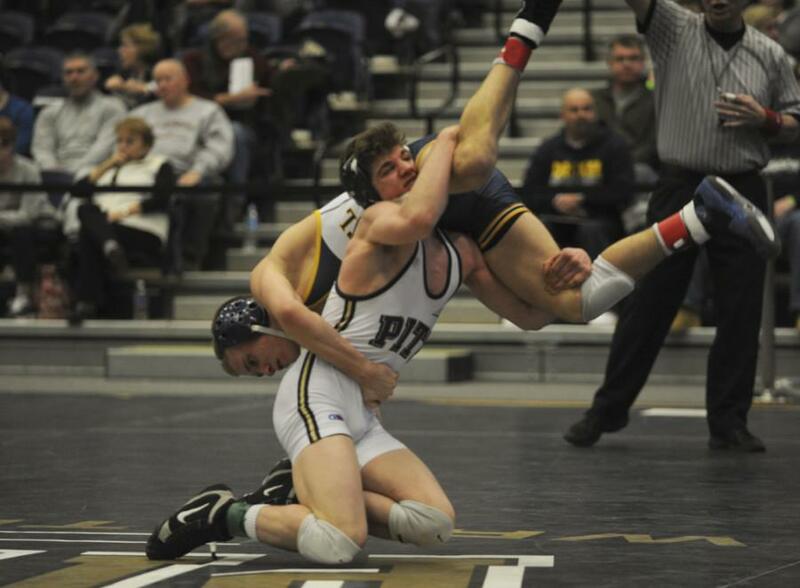 In Pitt Duals at the Fitzgerald Field House on Saturday, the No. 20 Panthers defeated Duke, Davidson, Brown and Franklin and Marshall, behind a few decisive individual wins from Cody Wiercioch and Nick Bonaccorsi. In the final match of the day, Pitt (7-1) beat Franklin and Marshall 25-12, with Wiercioch’s 165-pound tech fall. Wiercioch’s result was indicative of the team’s performance on Saturday. To start off Pitt Duals, the hosts defeated ACC opponent Duke 23-19, in the only competitive match of the day. The Panthers moved on to steamroll Davidson 43-3 and Brown 29-9. Assistant coach Drew Headlee said the Duke win was important because it was the only conference opponent the team faced on Saturday. Pitt hosted the event, which started at 9 a.m. and also featured Harvard, North Carolina State, Bloomsburg, Columbia, Edinboro and Hofstra. Pitt head coach Jason Peters said team mainstays like Wiercioch and Bonaccorsi helped keep the team’s performance level all day. Against Franklin and Marshall, Bonaccorsi pinned his opponent after building a large early lead, moving Pitt’s advantage to a decisive 25-9 heading into the heavyweight bout. Peters said that effort was a nice improvement from the beginning of the day, when Pitt couldn’t build an early lead over Duke. “The first match, we stood around a lot and didn’t get going. We were a little lazy getting back to the center,” Peters said. Next time out, Pitt will stay in the Fitzgerald Field House and host No. 7 Oklahoma State on Jan. 17 at 2 p.m. The event will be the first of a four-match home stretch. Headlee said the next match will be key to preparing the team for ACC Championships in March. Peters added that the rankings can help group skilled teams, but individual performances matter more than the polls.